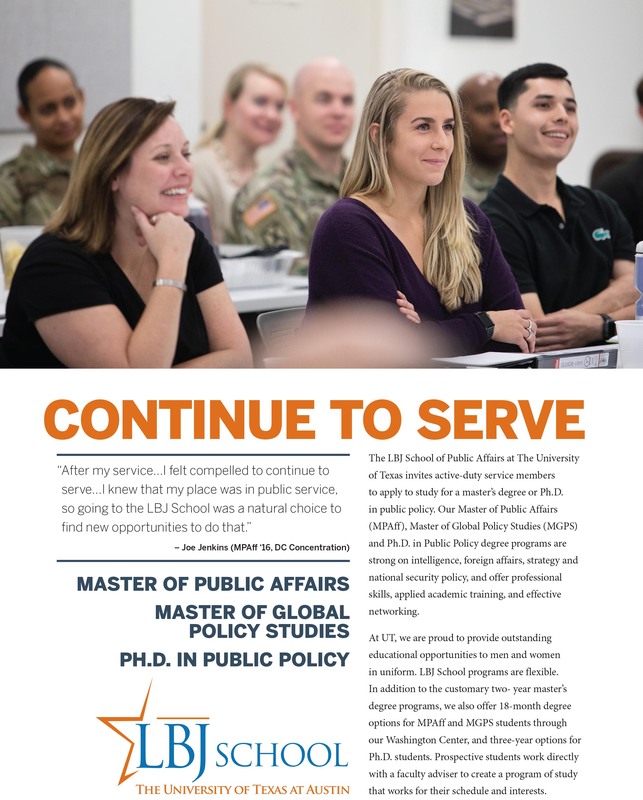 The LBJ School of Public Affairs at The University of Texas at Austin invites active-duty service members to apply to study for a master’s degree or Ph.D. in public policy. Our Master of Public Affairs (MPAff), Master of Global Policy Studies (MGPS) and Ph.D. in Public Policy programs are strong on intelligence, foreign affairs, strategy and national security policy, and offer professional skills, applied academic training and effective networking. This webinar will focus on the experience of LBJ students affiliated with the military. This is your chance to ask questions about the application process, curricular details, school-military balance and more. Current LBJ students Brandon Podojil, Nathan Bumagny and Christopher Piskai will join the webinar to talk about their experience.